Below: 2 EME array. 4 x 5 elements beaming Sth ZL. Bob ZL1RS and I planned a trip mid 2010, to the top of New Zealand to attest the internal 2 m MS record. 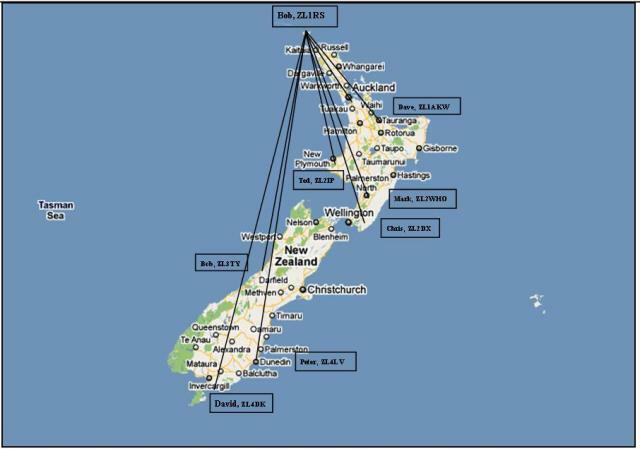 From the far South of New Zealand David ZL4DK set up his station at the Bluff. Path distance worked was 1405 km, ZL1RS/p to ZL4DK/p. Peter ZL4LV was also worked on 2 m MS. All other contacts were direct via tropo using either JT65 or SSB. Best DX on 10 GHz (3cm) was 331 km to Simon ZL1SWW and best DX on 1296 MHz was to Dave ZL1AKW at 485 km with aircraft enhancement. The picture on the left shows the 2 m contacts. Bob ZL1RS also operated 2 m EME to EU with JT65. The next day we decided to operate 2 m EME from the Ninety mile beach, also in RF65.The pictures below tells the story and activity. Below; Bob ZL1RS operating JT modes. Below; The next day down on Ninety mile beach. More contacts on 2 m EME towards EU. Above; 3 cm or 10 GHz beaming Sth ZL to Simon ZL1SWW in central Auckland at 5/7 both ways. Driving back home, down the Ninety mile from RF65 back into RF64. This beach is a public road and legal to drive on.